Cadbury Chocolate Eggs Are Infected With HIV-Positive Blood-Fiction! - Truth or Fiction? Warnings spread across social media about Cadbury products being infected with HIV-positive blood in the weeks leading up to Easter, when many Cadbury products are purchased. False reports about food being tainted with HIV have become somewhat common in recent years. False claims that Cadbury products are infected with HIV became the latest variation of the rumor in spring 2018. False rumors that Cadbury products are infected with HIV circulated on social media in spring 2018. 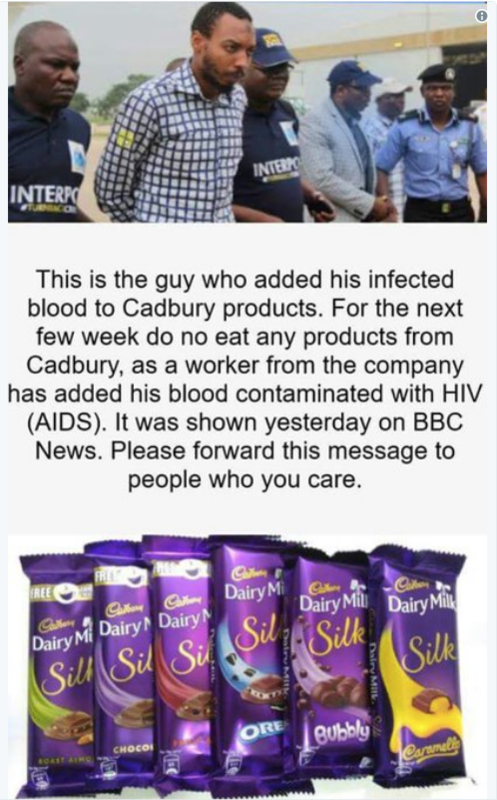 First, BBC didn’t report that Cadbury products were contaminated with HIV. Second, the man pictured in the photo is Aminu Ogweche, a Nigerian terrorist who was the mastermind of a bombing attack in April 2014 that killed 75 people. By all accounts, Ogweche never worked for Cadbury and has not been diagnosed with HIV or Aids. The same photo of Ogweche was used in a separate false claim that a Pepsi worker tainted Pepsi products with HIV-infected blood in August 2017. We’ve also investigated false rumors about blood oranges, bananas, canned foods and ketchup being infected with HIV. None of them are true. AIDS Warning: Worker Adds HIV-Positive Blood to Pepsi?